My name is Johny Sanchez. I was raised in a Catholic home since childhood. At the age of 12, my family was converted to the Mormon faith. I was a faithful Mormon, and even became an "Elder" in this church. In August of 1984, when I was 17 years old, and Independent Baptist pastor took the Gospel to our home. One of my sisters and I received Christ as our Savior that day. My mother had been saved shortly before and had asked the pastor to speak to us. Though I was sincere in my decision to receive Christ, I was so faithful in the Mormon church that I refused to attend the Baptist church. I even had to move out of my parents' home because I didn't want to hear my mother talk about the errors of the Mormon faith. After a while, I began to have doubts, and one day I read Galtations 1:8, "If any man preach any other gospel unto you than that ye have received, let him be accursed." After reading this verse, I realized that I was in a false religion. Nearly 3 years after receiving Christ as my Savior, I began attending the Baptist church. I immediately followed the Lord in baptism, and became a faithful member of church. I went soul-winning and served the Lord as music director and youth pastor. In March of 1989, I entered the Theological Baptist Institute, and graduated in December of 1991. After graduating, I began helping missionary Byron Willis in the small town of El Valle. Bro. Willis felt led to start a church in the nearby city of David, and I was called to pastor the church in El Valle. I began pastoring on February 14, 1993. Michelle and I were married on September 9, 1994, and our first child, Timothy Paul was born on December 10, 1996 (my birthday). The Lord placed on our hearts a burden for the "central provinces" of Panama. We began praying, and after resigning in May of 1998, we felt led to help another missionary who had a new work. We worked with them for 6 months before going to the U.S. for deputation in December of 1998. 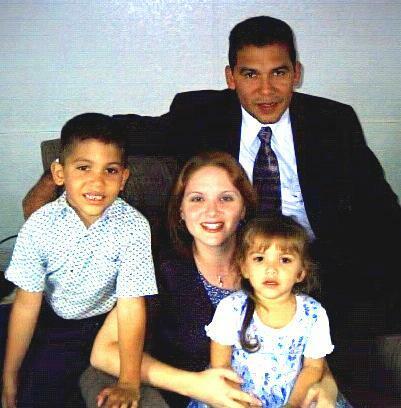 We returned in December of 1999, with another member in our family (Melody Renee, born on September 7, 1999), and worked with missionary Byron Willis for 2 months before moving to Santiago. Our third child, David Elias was born on February 6, 2006 and we are still serving the Lord in Santiago as we also start other missions in surrounding towns. The Lord has blessed our ministry tremendously. We started from scratch in February of 2000, and in addition to services on Sundays and Wednesdays, we also go soul-winning and give discipleship studies 3 times a week. We now have an attendance of over 200 on Sunday mornings and have 10 Sunday school classes, and a group of about 40 soul winners. We also have a Bible Institute and had our first graduation in November of 2007, with 7 graduates. Some of them want to start their own works, so we are praying for the Lord’s guidance in their lives. We also started a feeding center 4 years ago in a poor subdivision and the Lord has blessed and used the center to reach new families for Christ. We are in the process of opening another feeding center and starting a new church in a town about 45 minutes away from Santiago. Please pray that the Lord opens the doors for us to get this work up and going strong soon. My name is Michelle Sanchez. I was raised in a Christian home near a military base in Spain. My mother began attending an Independent Baptist church when I was 4 years old, and she enrolled me in our church-school for kindergarten. When I was 5 years old, a friend kept telling me that I needed to get saved or else I would go to hell, so my mom showed me how to be saved and I made a profession of faith and was baptized. As I got older, however, I had many doubts about my salvation and didn't feel the Holy Spirit's presence in my life. I even spoke to my pastor once, and he confirmed my salvation, but I felt the same afterwards. When I was 15 years old, my father was transferred to Panama, and I got involved in an Independent Baptist church there. One night, I went on visitation with the youth pastor's wife, and after hearing her explain the plan of salvation, I again had doubts concerning my salvation. After talking with her, I realized that I hadn't really understood what I was doing when I made my first profession of faith, and I had never really repented of my sins. I had just prayed a prayer without understanding its meaning. I accepted Jesus as my Savior of October 29, 1991, and was baptized on November 3, 1991. I served as a Sunday school teacher and an AWANA leader in church, as well as participating in the choir. I surrendered my life to serve the Lord during a Revival meeting in January of 1992, and met Johny while visiting missionaries in another province of Panama in December of 1992. We were married on September 9, 1994, and I have been serving the Lord full-time since then. I entered the Theological Baptist Institute after getting married and graduated in November of 1999. The Lord has blessed us with three precious children: Timothy who is 11 years old, Melody who is 8 years and David who is 2 years old. I feel blessed to be serving the Lord alongside my husband here in Santiago, Panama. Timothy recently told us that he feels called to be a pastor or missionary, so we praise the Lord and are praying for his will in all of our children’s lives.